Winning away at the current World Champions would have brought a greater sense of calm, but it would and should not have papered over the cracks that are beginning to show in the German national team. France overturned a poor opening half performance, and a one-goal disadvantage, to send Germany to a second consecutive defeat for the first time since 2000. Going into this encounter the mood was darkening around Germany, having gone out of the summer’s World Cup in embarrassing fashion their recent performances in the Uefa Nations League have done little to improve the atmosphere. A heavy three-goal defeat away at the Netherlands on Saturday showed a clear apathy and highlighted that Germany are very much in between generations. The older players whom have given so much for their country and were World Cup winners four years ago are no longer able to give quite as much as expected. Neither are the younger players quite at the level to make the succession seamless. There is a changing of the guard and, in charge, Joachim Low needs to manage it better for him to stay in the job. It feels harsh to put pressure on the manager that led Germany to World Cup success so recently, but a slight lack of direction seems to have appeared, a series of second-guessing himself has played its part in Germany losing six of their last 10 matches. The positive is that there is quality – and plenty of it – but ensuring that they can marry together is Low’s immediate concern. In Paris, Low made five changes from Saturday and their dynamic front-three did cause problems for France in the first-half. They were fully deserved of their one-goal lead going into the break – in reality, they could have scored three or four – but they could not match it in the second half when France began to actually play football again and test the German defence. Despite the attacking prowess that France possesses, little came to test Manuel Neuer in the opening period; Kylian Mbappe’s pace was rarely deployed, Antoine Griezmann was quiet whilst Olivier Giroud struggled to hold up the ball when it came his way. France were insipid and would have felt relieved to be at half-time having just conceded the single goal from a Toni Kroos penalty. But there were drastic improvements and Griezmann scored a second-half brace to send the World Champions four points clear at the top of League A Group 1. There were only 14 minutes on the clock when the French were kicking themselves. Having not got started, the hosts struggled to contain Germany. Presnel Kimpembe handled Leroy Sane’s cut-back and the referee pointed to the penalty spot; Kroos’s kick only just squeezed past Hugo Lloris’ outstretched arm into the net. 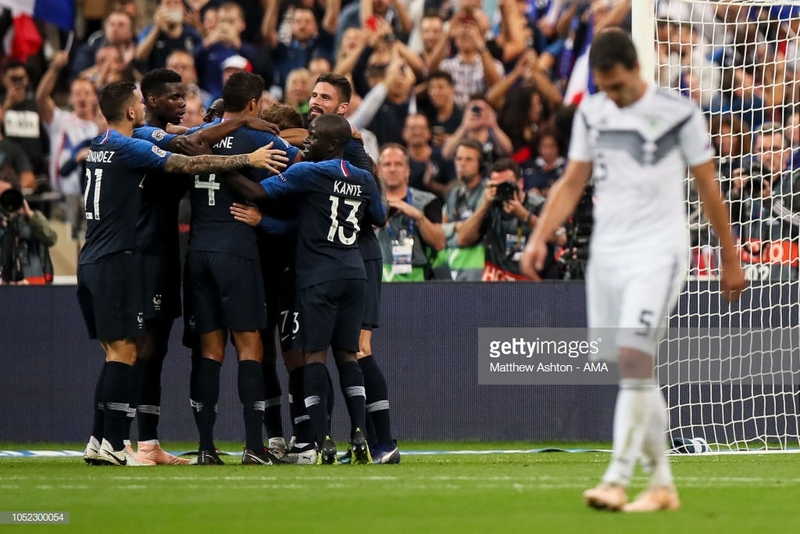 The France captain was called upon again some 10 minutes later when Matthias Ginter shot from close range, but Lloris managed to get down and provide a vital intervention. French forays forward were in rare supply during a subdued start; Giroud firing over the crossbar following Lucas Hernandez’s low cross was the only meaningful attempt. Neuer was finally tested early in the second half, stopping Mbappe when one-on-one with the talented teenager, but the goalkeeper was helpless just after the hour mark when Griezmann met Lucas’ delivery with a fine glancing header which found the top-right corner and brought life back to the Stade de France. The frailties that Germany have shown of late began to surface, when faced with an opposition with gritted teeth, they simply succumb. Griezmann completed the turnaround with ten minutes left to play by slotting in the second penalty of the game after Mats Hummels was adjudged to have brought down Blaise Matuidi with a skewed sliding tackle. The change in attitude was noticeable from the French, the hunger and desire returned in the second half and was ultimately too much for Germany. Mbappe showed his willingness to attack on the inside and outside of the German back four, Griezmann was instrumental in France’s attacking play but Paul Pogba struggled to make a telling impact in midfield. A flurry of late corners and free-kicks did present Germany with final chances to salvage a point, but they came to nothing. There was no victory to bring calmness to the German national side, but there were some positives. There is a sense that these competitive Nations League fixtures are just what Germany need after a disappointing World Cup rather than a misleading and easy Euro Qualifying campaign. This match along with those that preceded it have certainly showed that Germany have some issues to address.